I’ve been working on a new business idea which has kept me very busy lately. New businesses are always an exciting thing because it’s fun to fantasize about vast riches from the future success of your new baby. The fact that most new businesses usually end up with fairly pedestrian compensation, doesn’t reduce the excitement of the latest one. A book excerpt by Doug Stewart contains some very good time management tips. I think I will be checking this book out. The Finance Buff did a pretty good article on a financial advisor who lost his home. He points out that the advisor might have been smarter than we think. Boomer & Echo creates an investment policy. Canadian Capitalist analyses if it is worthwhile to switch to Vanguard Canada’s new ETFs. Michael James says that currency exchange costs are too high. Agreed. The Oblivious Investor gives some advice on how to become a fee-only financial advisor. Million Dollar Journey has 5 reasons why it’s better to rent than to buy. The blogger behind HowToSaveMoney.ca did an investing profile in the Globe & Mail with Larry MacDonald. He mentioned my blog as an influence which made me feel good. Financial Uproar offers up yet another, always entertaining link dump. A new business venture sounds very exciting. Take it to Dragon’s Den! The way you phrased my link reminded me of the Saturday Night Live bit about the “rent is too high” party. I should have used that in my post. Thanks for the mention. Thanks for the mention Mike! Any hints on the new biz? Web related? You’ve done a great job with this blog for a lot of years. Was happy to mention you in the article! What is this new business idea? (You don’t have to tell me, I’m just curious lol) Sounds like it is a good one! I love it when the entrepreneurship side of people comes alive- it’s so exciting. 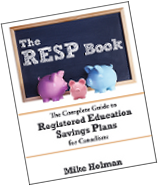 Next post: The RESP Book 2nd Edition Is Out!